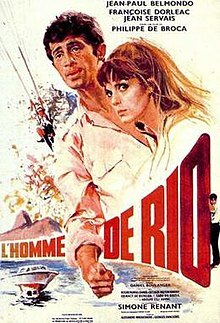 That Man from Rio (French: L'Homme de Rio) is a French/Italian international co-production 1964 adventure film directed by Philippe de Broca and starring Jean-Paul Belmondo and Françoise Dorléac. It was the first film to be made by the French subsidiary of United Artists, Les Productions Artistes Associés. The film was a huge success with a total of 4,800,626 admissions in France, becoming the 5th highest earning film of the year. This fast-moving spoof of James Bond-type movies features striking location photography by Edmond Séchan of Rio de Janeiro, Brasília, and Paris. At the 37th Academy Awards, the film was nominated for the Oscar for Best Writing, Story and Screenplay. The story has been inspired by the series of comic albums The Adventures of Tintin. As airman Adrien Dufourquet embarks on an 8-day leave in Paris to see his fiancée Agnès, two South American Indians steal an Amazon statuette from a museum and force Professor Catalan, the curator, into their car. Catalan was the companion of Agnès' father on an Amazon expedition during which her father died. Catalan believes that the statuette is one of three which hold the secret to an Amazon treasure. Adrien arrives in time to see the Indians abducting Agnès, the only one who knows the location of her father's statuette, and he pursues them to the airport where he steals a ticket and boards the same plane. Adrien tells the pilot that his fiancée has been abducted, but Agnès has been drugged and does not recognize him. The pilot plans to have Adrien arrested when they reach Rio de Janeiro, but Adrien eludes the police upon arrival. With the help of Sir Winston, a Brazilian bootblack, Adrien rescues Agnès. They retrieve the buried statuette, but the Indians steal it from them. In a stolen car provided by Sir Winston, Agnès and Adrien drive to Brasília to meet Señor De Castro, a wealthy industrialist who possesses the third statuette. On the way, they come across the Indians' car with Catalan slumped inside; after picking him up, they drive on to Brasília. At a party in their honor, De Castro takes Catalan to his strong room to assure him of the statuette's safety, and Catalan, who planned the museum theft, murders him and steals the statuette. By the time Adrien discovers the body, Catalan and the Indians have abducted Agnès again and escaped in a seaplane. Adrien steals a plane and follows. In a floating jungle cafe run by Lola, the woman who financed Catalan, Adrien learns that Catalan murdered Agnès' father and that Agnès is being held in a boat. Rushing to the boat, Adrien hangs onto the side as it heads upstream and finally docks. While Catalan goes to the underground location of the treasure, Adrien knocks out all of Catalan's accomplices and rescues Agnès. Catalan finds the treasure, but an explosion set off by a nearby highway construction crew causes him to be buried with it. Adrien and Agnès flee the jungle and arrive in Paris in time for Adrien to catch his train back to garrison. The film was a follow up to Cartouche, a popular swashbuckler with Belmondo. It was decided that he should star in a James Bond spoof. Italian finance meant the Italian actor Adolfo Celi was cast. Jean-Paul Belmondo's personal tastes were Tintin comics, sports magazines and detective novels. He said he preferred "making adventure films like Rio to the intellectual movies of Alain Renais or Alain Robbe-Grillet." That Man from Rio was released in France on 28 February 1964. The film was nominated for Best Original Screenplay at the Academy Awards. In contemporary reviews, the Monthly Film Bulletin reviewed and English-dubbed version noted that the "One may feel that [de Broca]'s inconsequential wit is better suited to the smaller, more parochial atmosphere of his earlier films, but here he is involved in a big budget production aimed at a huge audience, and perhaps we ought to be grateful that so much of his personal style has survived, even in the carefully dubbed and slightly shortened American version now presented." The review noted that the film was "beautifully organised" and that "it always keeps the chuckles rising even if they seldom break into real guffaws." and praised the two leads, specifically Belmondo who "outdid Douglas Fairbanks in agility, Harold Lloyd in cliffhanging, and James Bond in indestructibility". In a retrospective review, The Dissolve gave the film a rating of three and a half stars out of five, noting that "the action moves along at such a rapid clip, there’s little time to worry about how much the plot relies on incredible coincidences". ^ "That Man from Rio box office information". Box Office Story. Retrieved 24 August 2016. ^ Barry, Joseph (21 June 1964). "THAT MAN' BELMONDO ON A MOVIE MERRY-GO-ROUND". New York Times. p. X7. ^ "L'Homme de Rio (1963) Philippe de Broca" (in French). Bifi.fr. Retrieved 7 May 2018. ^ a b Clark, Craig J. (June 29, 2015). "That Man From Rio Up to His Ears". The Dissolve. Archived from the original on July 8, 2015. Retrieved July 7, 2015. ^ a b "Homme de Rio, L' (That Man from Rio)". Monthly Film Bulletin. Vol. 32 no. 372. London: British Film Institute. 1965. p. 87. This page was last edited on 20 September 2018, at 18:43 (UTC).